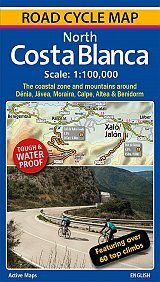 A 100,000 scale detailed road cycle map for North Costa Blanca (the coastal zone and mountains around D�nia, Xabia/Javea, Moraira, Calpe, Altea & Benidorm). Easy cycle route planning with road classifications, distance markers between key junctions, top climbs, spot heights and relief representation. Includes 11 classic route suggestions that pass through valleys, go high up into the mountains, visit unspoilt villages and towns and meander along the coast. 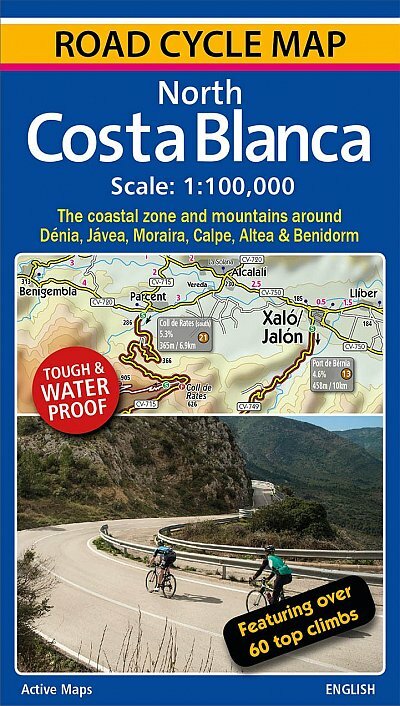 Features over 60 top climbs marked on the map with details of gradient, ascent and length (Coll de Rates, Port de Tudons, Confrides, Cumbre del Sol, Port de B�rnia, Miserat, Vall d'Ebo, Coll de la Garga, and many more). Some of the key inland towns on the map include T�rbena, Castell de Castells, Xal�/Jal�n, Pego, Villalonga, Sella, Guadalest, L'Orxa, Benifallim, Planes, Muro de Alcoy). The map is printed on tough and waterproof paper.